The definition of noisome is harmful, or bad smelling. An example of something noisome is a gas that is coming from a toxic waste dump; noisome gas. 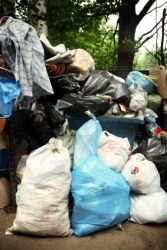 An example of a noisome smell is the smell of a disgusting trash can. "noisome." YourDictionary, n.d. Web. 14 April 2019. <https://www.yourdictionary.com/NOISOME>. Offensive to the point of arousing disgust; foul: a noisome odor. Harmful or dangerous: noisome fumes. Middle English noiesom noie harm ( short for anoi annoyance ) ( from Old French) ( from anoier to annoy ; see annoy . ) -som adj. suff. ; see -some 1. Usage Note: People sometimes assume that noisome means “noisy,” because the two words sound similar. But in our 2011 survey, 89% of the Usage Panel found the sentence We could barely hear each other with the noisome helicopter overhead to be unacceptable. If you use noisome as a synonym for noisy, there's a good chance that others will misinterpret your words and think you're describing someone or something as being offensive or harmful. Hurtful or noxious to health; unwholesome, insalubrious. Offensive to the senses; disgusting, unpleasant, nauseous; foul, fetid, especially having an undesirable smell; sickening, nauseating. From Middle English noy (short for annoy, from an(n)oien, enoien from Anglo-Norman anuier, from Old French enuier (French: ennuyer), from Late Latin inodiare (to make hateful), from in- (intensive prefix) + odium (hate). In expanse, and forms one of the most noisome and injurious of insect pests.